My hope is that your experience in the school is both enjoyable and rewarding. I would also encourage you to share your newfound knowledge with others. Christians are called by God's word to serve (Galatians 5:13; Matthew 25:31-46). The greatest service we can provide is sharing our knowledge of the scriptures with those who do not understand or have yet to hear the soul saving truth. On the masthead of the school website you will see a prominently placed Bible verse. Second Timothy 2:2 reads, "And the things that you have heard from me among many witnesses, commit these to faithful men who will be able to teach others also." This verse constantly reminds me of the goal for the ongoing efforts of the school. There is a profound responsibility to pass on the truth of God's word to others. All who are involved in the efforts of the school believe strongly that comprehensive, in-depth, Bible study is for everyone, not just a select few. An accurate understanding of God's word is vital for successful Christian living. Therefore, the school was created to provide free, online, Bible instruction so that all might gain a deeper understanding of the scriptures. The curriculum is designed to promote both intellectual and spiritual growth, realizing that the two should never be separated but are complementary and mutually dependent. While the school can be a great tool for training ministers, church leaders and Bible class teachers, it also provides great resources for anyone who wants to simply study God's word and grow in understanding of His will. We are all called by God to know His word (2 Timothy 2:15), to live in accordance to it (Matthew 7:21-27; James 1:21-22) and to tell others about it (Mark 16:15-16; 2 Timothy 4:2). May God bless you as you seek to fulfill His will in your life. Have you ever wished to visit the Bible lands? If you are not able to make the journey yourself the next best thing could be watching the following programs. These instructional video presentations, shot on location, let you explore many of the religious and historical sites in Israel, Jordan and Palestine. They are produced by WVBS and are completely free to view online. The first recommended video is "Passage 1 | Jerusalem: An Unforgettable City." We received many positive responses from students concerning the quality and content of this video. 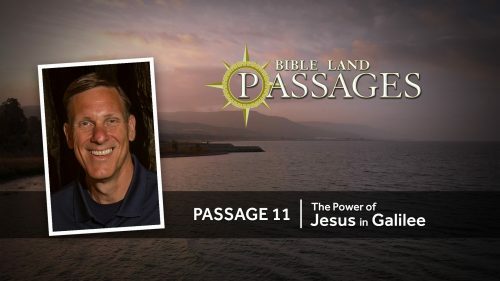 The second video in the series is "Passage 2 | The Ministry of Jesus in Northern Israel." Like the first this is a short lesson, less than thirty minutes long, but it contains a wealth of information. The third video in the series is now available. It is called "Passage 3 | Dan: City of Unfaithfulness." This 17-minute documentary shows the significance of Dan as a center of idolatry and unfaithfulness to God. Important aspects of Dan are explored. First, its location in the northern section of Israel helped to define the extent of the land controlled by the Israelites. Second, the modern site of Dan is important because of the archaeological discoveries that have been made. What archaeologists have unearthed really helps us to have a better understanding of both Old Testament life and the full veracity of the Bible. Third, the site of Dan is very important because of the evidence of idolatrous practices confirming the Bible's description of their unfaithfulness and loss of identity as God's people. These videos may be found under the "About" option on the blue menu bar by clicking the Recommended Videos link. When you click this button you will be taken to a page which will be continually updated with information concerning free videos available for online viewing which may be of interest to you. The syllabus for each course is provided to serve as a roadmap for the class. It identifies specific course content, goals and focus. The syllabus also includes basic course information, a course rationale and course objectives. The syllabus for each course can be found on its course page. You will notice tabs below the title thumbnail for "Description" and "Syllabus". When you click on the appropriate tab the document will be displayed. If you desire a printed copy of the syllabus, there is a “Print” button located to the upper-right of the displayed document where you can print personal copies. As you read the syllabus you will find general information about the course such as the instructor, the number of video lessons and the approximate length of each lesson. You will also find a description of the course and the purpose of the course. You will be informed concerning the necessary materials provided for the course such as video lessons, course notes and course books. Formal and Informal Students have the Course Notes and Course Books provided to them for free online viewing. These students have chosen to do the required assignments for the courses so they can earn a certificate. Their course assignments include not only viewing all the lessons but also completing term papers and tests. I often find that students are hesitant to upgrade their enrollment to the Formal or Informal status simply because they do not want to take tests. However, the opportunity to be tested on the information learned is one of the most valuable elements of the school. When you prepare yourself to take the test you gain a deeper understanding of those things learned. The information is better grasped and retained in your mind. We attempt to make the taking of tests as painless as possible. The students are allowed to download the tests at anytime and may use the tests as a study guide while viewing the videos. On most tests the student is provided the page number in the course notes where the answer can be found. The numbers in brackets [ ] after each question on the test are the page numbers in the course notes and/or the scripture citation that the question is based upon. The goal is to make the school as user-friendly as possible. The syllabus for each course and course tests are great examples of helpful resources provided for your benefit. Thanks be to God for the opportunity to engage in a comprehensive study of His word.